Today proved a difficult one for both competitors and race officials alike at the RORC Easter Challenge. 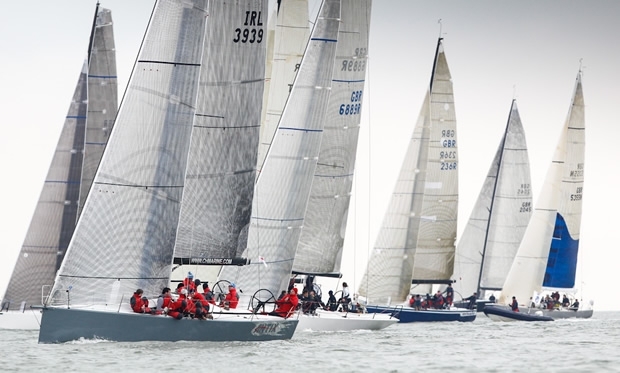 Under a grey overcast sky, race three of the series got underway on time in light breeze, but on the second beat the wind turned inside out, causing the race to be shortened, finishing at the end of that leg. After this the wind resolutely failed to return, causing today’s final two races to be cancelled. First to come in on the new breeze and hoist their kites upwind was the Farr 45 Espresso Martini (making up for her grounding yesterday) and she ended up being first home, followed in by Jonathan Goring’s Ker 40 Keronimo, these two beating the two biggest boats in the RORC Easter Challenge fleet to the finish line on the water. Overall leader in IRC One is now Michael Bartholomew’s King 40 Tokoloshe, six points ahead of Keronimo. In IRC Two Jim Macgregor and his Elan 410 Premier Flair have hung on to their overall lead after today’s race, now just a point ahead of Niall Dowling’s new J/111 Jazzband, although today’s race was won by Joopster, Neil Kipling’s J/122. “The bias was swinging at the start and we were going for the pin end and then the bias went 10° the other way, so we went back to the committee boat,” Jim Macgregor described his start. “We weren’t going fast at the gun, but we were going in the right direction and we spotted the pressure up on the left and those that went right lost on the first beat.” Premier Flair led around the top mark and held on during the run. Finishing fourth today, Macgregor adds that he is finding the RORC Easter Challenge a good gauge of the competition lining up soon for the British team’s trials for the Brewin Dolphin Commodores’ Cup. Elsewhere Peter Morton on his Mat1010 won today’s race in IRC Three to take the lead from the British Keelboat Academy squad sailing David Aisher’s J/109 Yeoman of Wight. In IRC Four A Grant Gordon and his J/97 Fever continued her unbroken run of bullets as did Nigel Biggs’ MG30 Checkmate XV in IRC Four B. However in the J/80 one design class, Rachel Woods’ Jumblesail won today’s race, breaking Rob Larke’s previously perfect scoreline on J2X. Round the world navigator Steve Hayles, racing with the British Keelboat Academy on the Farr 45 Kolga, felt that the race committee had made the right call to send the fleet home mid-afternoon. Two races are scheduled for tomorrow with the first start due at 1000.